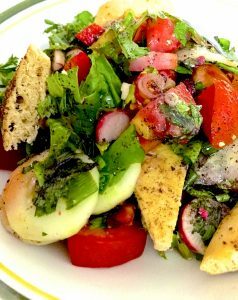 Fattoush Salad – A fresh delicious bread salad, where the herbs are not meant just for garnish but are significant ingredients in the dish. Three ingredients normally used in Lebanese cuisine are featured here, i.e. flavouring the pita bread with za’atar, dressing the salad with sumac mixed with extra virgin olive oil and vinegar, and adding pomegranate molasses to lift the salad to sublime heights. The za’atar is sprinkled on the pita bread or other flat bread, and the bread is baked or grilled before it is added to the salad. 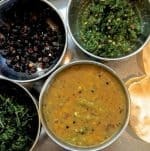 The za’atar we use for Lebanese dishes, is a spice usually made from dried ground thyme, oregano, marjoram or a combination of the three, with toasted sesame seeds, dried sumac, and salt. Sumac is a deep red berry which is powdered to a spice which has a mildly tangy lemony flavour. 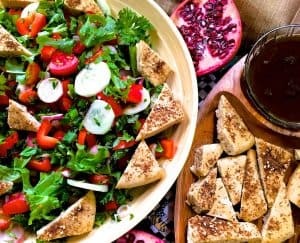 There are many versions of the recipe for fattoush though I have tried to identify an authentic Lebanese version of the same and have prepared the dish accordingly. 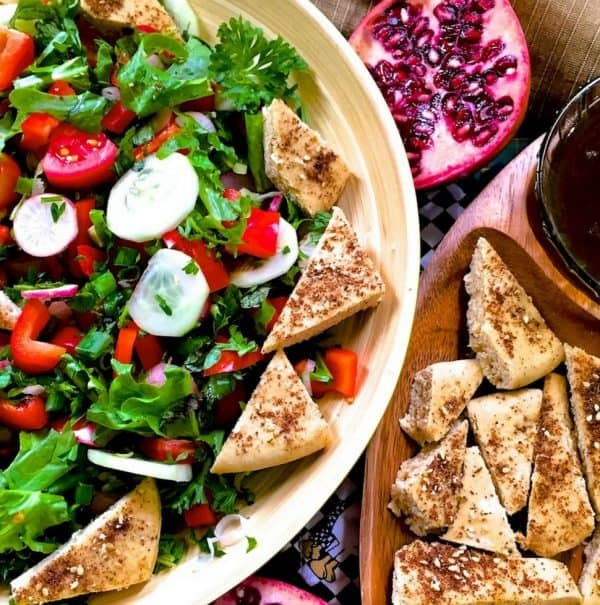 The recipe for pomegranate molasses to dress the Fattoush, is from my daughter Mridula. She gave me precise instructions including a warning that the melted molasses would be ‘super hot’ and to be careful. The first time I made this recipe, I made the mistake of preparing the molasses first. It looked very good and I left it to cool while I got the rest of the salad ready. When it was time to serve, I turned to the molasses and found it had congealed and was sticking desperately to the bowl and could not be scraped off. I thought I could melt and use it, so I popped the glass bowl of molasses into the microwave and set it for 2 minutes. The next thing I heard was the tinkle of glass as the bowl shattered in the high temperature generated. The microwave was already hot since I had baked the pita bread a few minutes ago, and the added heat of the melting molasses took the glass literally to breaking point. So I learnt to my cost 1. Not to be absentminded while using the microwave and 2. To make the molasses right at the end, just before serving! 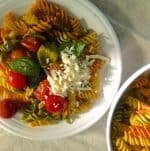 This salad is rich in nutrients and health properties. Za’atar and Sumac are said to be high in anti-oxidants and the USDA has reported that studies are on for the use of sumac in treatment of breast cancer and colon cancer and for reducing the side effects of chemotherapy such as nausea. Sumac tastes lemony and salty and has been used not only in the Middle East but also by Native Americans in food, as dyes and for medicinal purposes. Pomegranate arils contain are a source for fibre, protein, vitamins and potassium, all essential for wellbeing. They are thought to reduce the risk of heart disease as well as reduce growth of cancer: https://naldc.nal.usda.gov/download/7460/PDF The juice and peel of pomegranates are said to contain powerful antioxidants such as punicalagins that help reduce inflammation. There are studies with preliminary findings suggesting that pomegranates help in inhibiting the growth of cancer cells in cancers such as breast cancer and prostate cancer. Parsley contains components with health benefits, viz volatile oil components and flavonoids (again with anti inflammatory and anti oxidant properties), folic acid and vitamins. Tomatoes are rich in lycopene, and many varieties contain higher levels of Vitamins A and C.
Radishes are high in fibre and in potassium. They are said to have anti inflammatory and diuretic properties which may be helpful in counteracting the effect of some urinary conditions. Radishes are detoxifiers and are rich in vitamin-C, folic and anthocyanins. 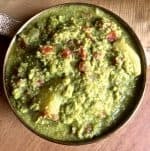 Cucumbers are noted for a high level of Vitamin K.
Squeeze fresh lemon juice, add vinegar, crushed garlic , salt and the dissolved sumac with the water in which dissolved, and whisk. I used white wine vinegar, but red wine vinegar could be substituted, or you could skip the vinegar altogether. Add the olive oil in a slow steady stream and whisk continuously till the dressing emulsifies and becomes translucent. Set the dressing aside. Sprinkle olive oil and then za'atar on the pita bread, cut into small triangular shapes, and set to bake in a preheated oven at 165 deg C (325 F) for 10 minutes. Remove from the oven and set aside. Mix the sliced veggies together: the thinly sliced radishes, red and white, tomatoes, scallion bulbs, cucumber slices. Set the sliced vegetables on a bed of greens. Sprinkle salt and mix gently. Add the pieces of baked bread flavoured with za'atar. Sprinkle pomegranate arils. Serve the salad and dress individual servings with 1 tbsp of lemon olive oil dressing (shake the dressing before using) and 2 tsps of pomegranate molasses. Sprinkle a little sumac and serve. Prepare the pomegranate molasses a short while before serving (read my story in the post above as to what happened when I made them too early). Use a ratio of 8:1 for the pomegranate juice and water. Refer Ingredients for Pomegranate Molasses above. Heat a pan, add the water, sugar, pomegranate juice and lemon juice and cook on high heat for about 2 minutes (or less) till the sugar dissolves. Reduce the heat and continue to cook for about 5 minutes till the liquid is syrupy and begins to thicken, becoming jelly like. It will be very very hot at this stage and care is to be taken while stirring. 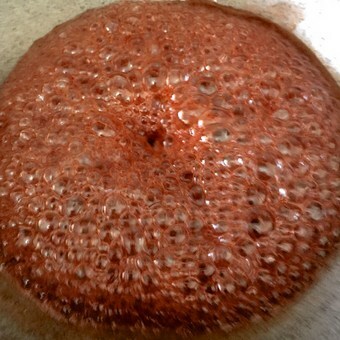 When the molasses begin to look jelly like, you need to quickly turn off the heat. 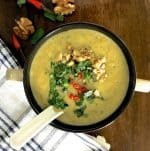 You could keep it warm in a bowl of warm water, as it can become thick and harden as it cools. Thanks Teena Sunoj! Let me know what your fav version is too! 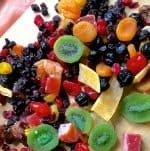 Love this salad cudnt resist checking out your version.